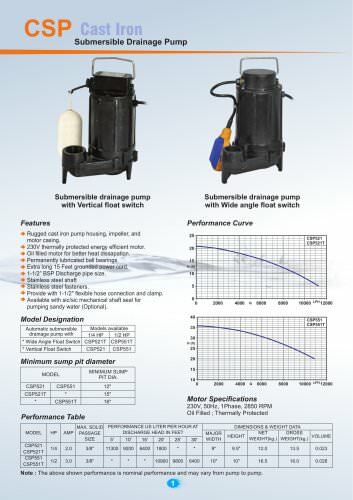 Catalogs > LUBI INDUSTRIES LLP > Cast Iron Submersible Drainage Pumps 50Hz. Submersible Drainage Pump Submersible drainage pump with Vertical float switch Submersible drainage pump with Wide angle float switch ^ Rugged cast iron pump housing, impeller, and motor casing. # 230V thermally protected energy efficient motor ^ Oil filled motor for better heat dissapation. ^ Permanently lubricated ball bearings. # Extra long 15 Feet grounded power cord. 4 1-1/2" BSP Discharge pipe size. jf Stainless steel shaft # Stainless steel fasteners. # Provide with 1-1/2" flexible hose connection and clamp # Available with sic/sic mechanical shaft seal for pumping sandy water (Optional). Model Designation Performance Curve Minimum sump pit diameter Performance Table Motor Specifications Oil Filled ; Thermally Protected Note : The above shown performance is nominal performance and may vary from pump to pump.